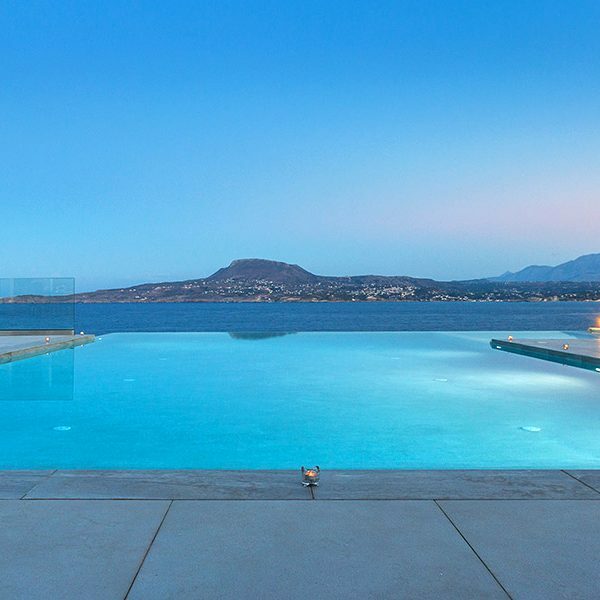 Villa Imperial in Chania, Crete is the brand new member of the LRC group and a villa that sets very high standards of luxury. 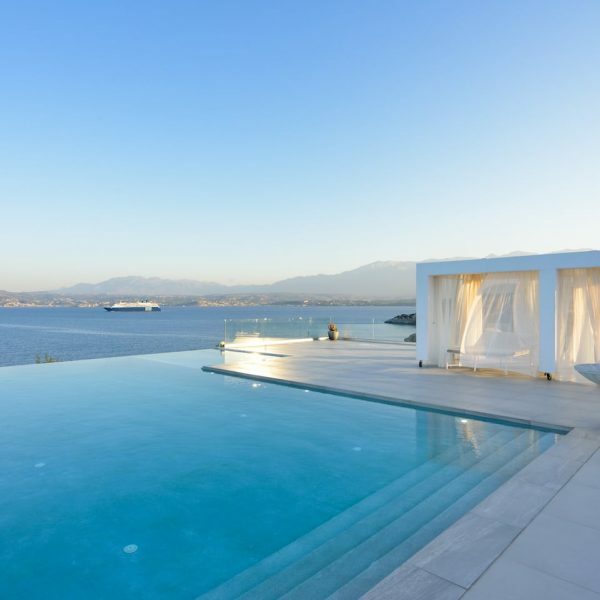 Cliff-hanging between the two beautiful bays of Akrotiri peninsula, Marathi and Loutraki, Villa Imperial in Chania offers an unbeatable view of the sea that cannot be compared with anything else making you wonder at your whereabouts. At the end of a private driveway stands an awe-inspiring two-storey, imposing set of buildings surrounded by 3000 sq meters of land, thus making it ideal not only for accommodation but also for various celebrations of up to 300 people. The serene combination of green, earthy and blue hues of the construction complements the already existing beauty of the Cretan landscape. The outdoor area is characterized by simplicity and ambiences that relax you and help your mind drift off. The pool and built in Jacuzzi have been designed in line with the impressive sea and sky views that can be experienced from the villa. A view that we recommend you enjoy under the shade of the pergola and its intertwining fragrant jasmine. The outdoors can be relished either by sitting at the clean-lined table under the pergola or by lying on the sun-loungers by the pool. Conveniently adjoining the area is the all-white and mirror backsplashed kitchen, which is fully equipped with all modern apparel, and the indoor dining and sitting area that leads on to the rest of the house. The Villa Imperial in Chania has a minimal yet eclectic style with touches of brass and gold colors. 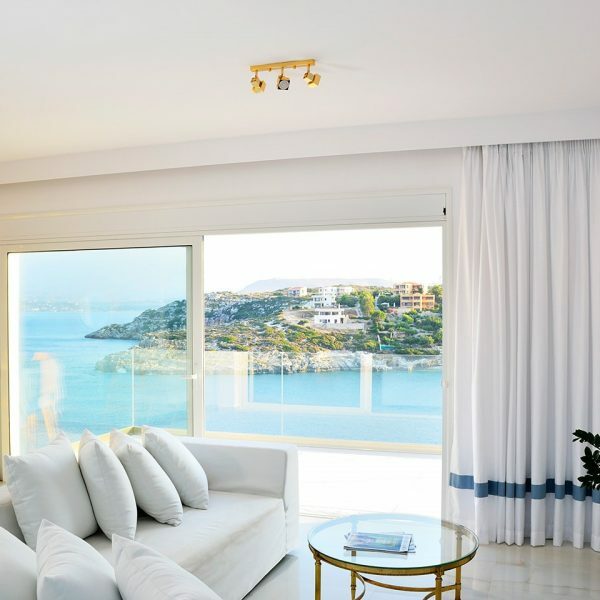 In tandem with the lush, white curtains, which drape the sliding glass doors that lead on to balconies that offer unobtrusive views of the Loutraki Bay, the décor brings to mind the old Regency style. This was the basis of the whole construction and decoration of the villa to begin with and it is what makes it unique and greatly different from today’s contemporary trends. All six sleek bedrooms have en suite granite-tiled bathrooms and Jacuzzi showers, and wash basins resting on high-quality marble tops with gold trimmings. Guests can luxuriate in deep slumber on anatomic mattresses, which guarantee their comfort and relaxation, and wake up to riveting views of the bay. Depending on guests’ wishes, two of the bedrooms can become twin or double while a sofa-bed in one of the three living rooms allows for an extra double bed. The tiled patio that can be accessed from this area and all of the four bedrooms that are on this floor leads onto lawns adorned with olive trees. Finally for those who wish to rest quietly for the duration of the whole day at the Villa Imperial in Chania there is a path that can take them to the rocky side of the Loutraki sea where they can take pleasure in the crystal cool waters of the sea. 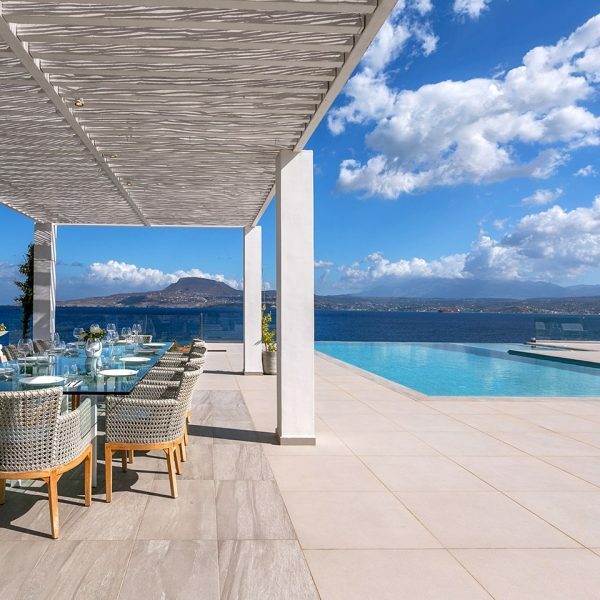 Overall, Villa Imperial in Chania was designed and created by its owners with a view to combining functionality with comfort, independence and aesthetics. 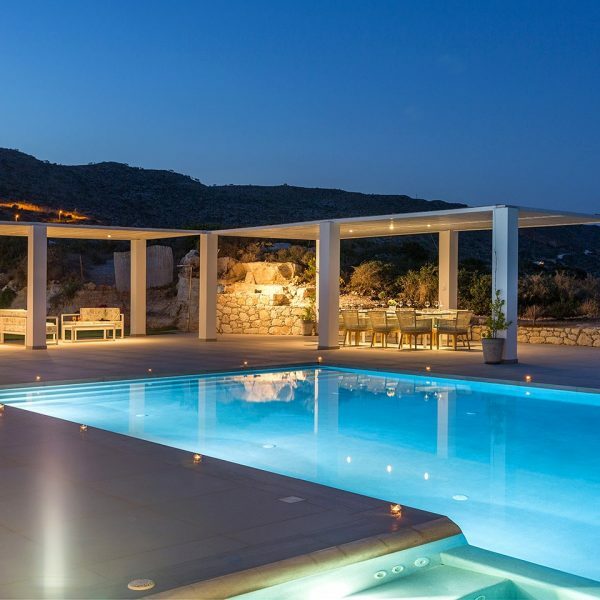 It is a villa that can definitely be the highlight of your holidays. One important advantage of the Villa Imperial in Chania, is that the pool and jacuzzi can be heated upon request (with extra charge).